Gloves are handy sets of protective wears to have within reach for individuals working in medical field as well as some other industrial sectors. Besides offering protection, comfort and suitability/functionality should also not be neglected. Therefore, in selecting a good glove to work with, it is important to pay close attention to certain things. As with every other item we do use, most of the properties that are linked with gloves, are usually impacted by their material composition. 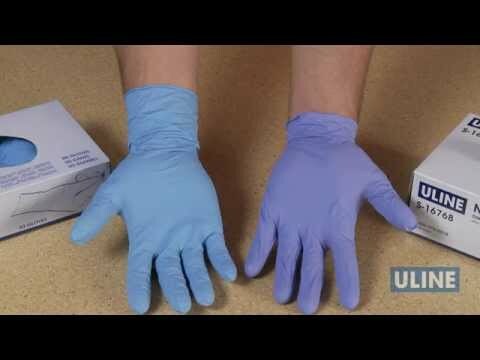 What Are Nitrile Gloves Made Of? Nitrile gloves are made from synthetic rubber and are vastly employed in the medical sector and many other areas – from food service applications to spas, tattoo-making and so on; this is a testament to their versatility. Furthermore, Nitrile gloves are often seen as the best alternatives for anyone having latex allergy; they are very safe to work with and gives a comfortable and secure fit. They tend to conform to the shape of the wearer’s hand upon reacting with body heat. Although most of the best nitrile gloves available in the market are powder-free; they are yet very easy to wear and pull off. Notwithstanding, there are those that are lightly powdered to permit easier and/or slicker donning. Again, they are usually subjected to chlorination in order to make them softer – as such, this set of gloves are generally known to be highly tactile thus ensuring the smooth flow of work while they are being worn. If there is one edge [asides being latex-free] that Nitrile gloves have over other types, it is the fact that they are immensely resistant to puncture [and even chemicals] hence their durability as well as functionality should have never been in doubt. As a matter of emphasis, This type of gloves have been found to be three times more puncture -resistant than those made from latex and vinyl. It may also interest you to know that – compared to latex & vinyl gloves – Nitrile work gloves are available in a variety of colours, and different professionals [that tend to wear hand protectors], love using a specific colour of Nitrile gloves. For instance, blue-coloured gloves are often preferred by medical professionals while the orange-coloured one will most likely be the preferred choice of mechanics and factory workers. What Are Latex Gloves Made Of? Latex gloves are typically made from natural rubber, and are commonly utilized by medical practitioners particularly during surgery as they are revered for their high sensitivity. But their use is certainly not limited to the medical line. Latex gloves are often chosen as the preferred option for handling biological materials, and preventing contamination when working in the laboratory. 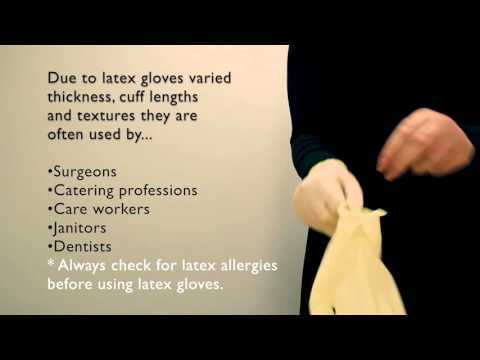 A major concern when considering latex gloves is hinged on the allergic reaction that may be triggered by a certain protein that is present in the latex. Owing to this, individuals that are prone to skin allergy usually avoid wearing latex gloves. The irritation may also be aggravated by the powder present in the glove. Latex gloves are basically biodegradable and are available in both powdered and powder-free varieties. In some instances, these gloves are coated with special formulations in order to put skin irritation in check. This idea of coating latex gloves will be highly appreciated by those who tend to wear the gloves for prolonged period of time [while working]. In terms of benefits, this type of gloves are appreciably functional. For one, they offer good protection against pathogens and are quite tactile sensitive which means that one’s work will not be hindered in any way while donning it. Plus, it is elastic hence it would fit perfectly unto the hand – just as though it were a second skin; they fit better than any other kind of glove. Additionally, latex gloves are very affordable and less expensive than nitrile gloves. What Gloves Are The best & Safe to Use? The two types discussed here, in this article, are certainly among the most widely used but they do differ in a number of ways. While nitrile may be the best alternative for those who are prone to allergies, latex score higher in terms of tactile sensitivity and comfort. Nevertheless, Nitrile gloves appear to have greater (overall) benefits than the ones made from latex. Moreover, the concern over allergy has made a lot of people – even the ones that are not known to have skin allergies – to sway towards nitrile gloves. Irrespective of the divide that exists between these two accessories, it is expedient that one pays heed to certain factors before going with a particular glove. One of such factors is to consider the purpose for which you intend using the glove. For example, while a latex may work fine in a laboratory, it could be a ‘total fail’ in the auto mechanic workshop. At this point, it would be advisable to settle for a more versatile option wherein a nitrile glove gets a mention.